Please join us TONIGHT May 22: Building Applications on a Budget with Reusable Code (Conférence québécoise des développeurs FileMaker 2014) earlier this month. May 22nd 6-8 PM IT Solutions Consulting, Inc. 414 Commerce Drive Suite 150 Fort Washington PA 19034 Please RSVP here if you are planning to attend this meeting. As always, pizza will be provided after the presentation, around 7:15 PM, along with post-presentation socializing and discussion. John presented this topic as a conference session at CQDF 2014 (Conférence québécoise des développeurs FileMaker® 2014) in early May 2014. John Mathewson is President and co-founder of Kyo Logic, LLC, a Platinum FileMaker development firm located in Westport, Connecticut. He is an organizational design expert and works with companies to create systems that improve productivity and increase business intelligence. John has developed database applications since 1986 in Visual FoxPro, MySQL and FileMaker Pro. He is a certified FileMaker 7, 8, 9, 10, 11, and 12 developer. The Philadelphia FileMaker User Group was founded in 2004 as an initiative by FileMaker Business Alliance Platinum member IT Solutions Consulting. The group’s goal is to provide an open forum for FileMaker developers and those interested in FileMaker to meet, brainstorm and network. We hold meetings the 4th Thursday of every month at 6PM, in the office of IT Solutions Consulting, Inc., at 414 Commerce Drive, Suite 150, Fort Washington PA. Meetings are open to all, regardless of background and there’s no charge to attend. 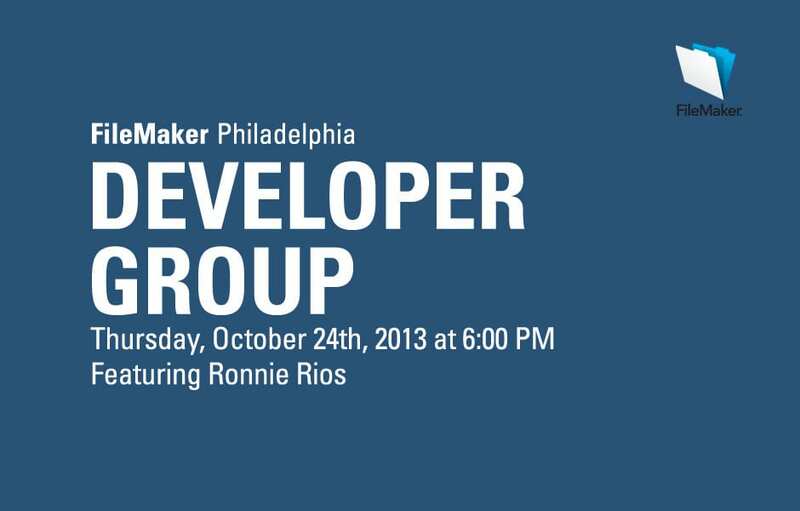 Greetings FileMaker Enthusiasts, Our next Philadelphia FileMaker Developer Group meeting has been scheduled for Thursday evening, May 22nd, 2014 at 6:00 PM. The meeting will be held at the IT Solutions office in Fort Washington. We’re pleased to have John Mathewson (Kyo Logic) presenting on Building Applications on a Budget with Reusable Code. John presented this topic as a conference session at CQDF 2014 (Conférence québécoise des développeurs FileMaker 2014) earlier this month. May 22nd 6-8 PM IT Solutions Consulting, Inc. 414 Commerce Drive Suite 150 Fort Washington PA 19034 Please RSVP here if you are planning to attend this meeting. As always, pizza will be provided after the presentation, around 7:15 PM, along with post-presentation socializing and discussion.